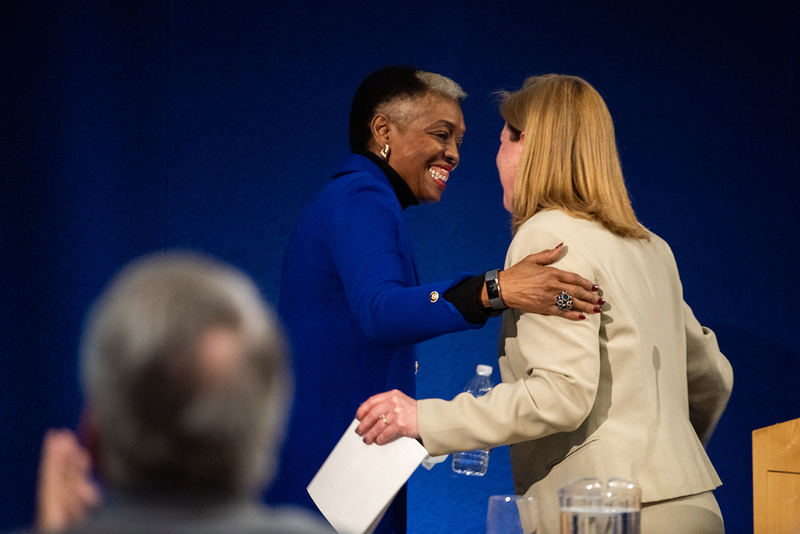 American Psychological Association President Rosie Phillips Davis visited SUNY New Paltz on Monday, April 1, to make a case that one of the most important collective actions we can take in the fight against poverty is to change our attitudes about impoverished people. Davis, who is also professor of counseling psychology at the University of Memphis, focused her Distinguished Speaker Address on the subject of deep poverty, defined as situations where a household’s annual income falls below 50 percent of the poverty line. Growing up as one of nine children in a household living at less than half the poverty line, Davis saw first-hand how hard it is for people in those circumstances to rise up, and how social stigma can make this struggle even more difficult. Since being elected president of the American Psychological Association, Davis has used her platform to call for argue that changing the way we think about poverty and its causes will be key to addressing the issue. “We want to change attitudes and perceptions about people in poverty, we want to change practice and we want to change policy,” Davis said. Readers can learn more online about the American Psychological Association’s Deep Poverty Initiative. Use this link to view a recent TED Talk from Rosie Phillips Davis about her work on poverty. Davis at one point discussed the effects poverty can have on college students, and the surprisingly high number of college students who report having experienced food insecurity and/or housing insecurity in national surveys. SUNY New Paltz supports students dealing with these issues in multiple ways. 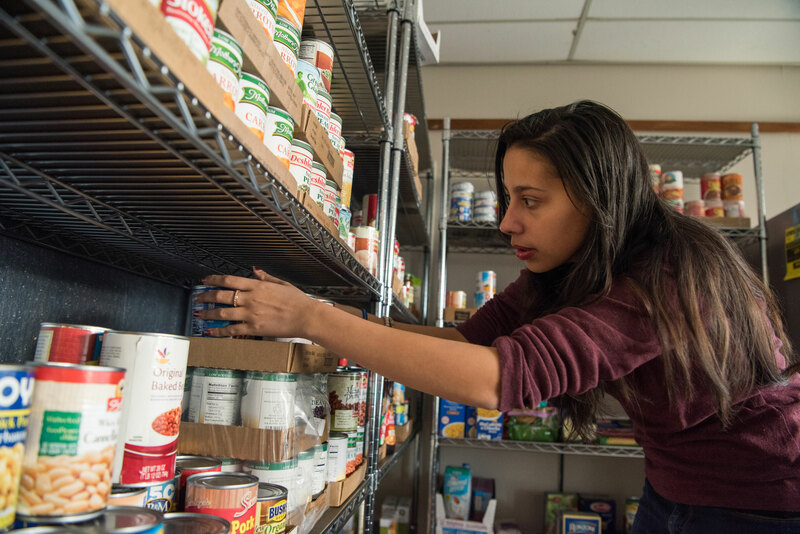 Since 2012, the College has been home to the New Paltz Food Pantry, in Student Union room 322, which provides food and some personal care items, free of charge, to students and staff. Follow on Instagram @NPPantry. The SUNY New Paltz Foundation also provides emergency support for students when they encounter unpredictable financial hardship that threatens their educational success. The Student Crisis Fund provides awards that can be used toward essential academic needs, replacement of lost or damaged items, basic needs, short-term housing or transportation. A number of other emergency funds are available to provide tuition assistance to students whose ability to continue at SUNY New Paltz is threatened by a sudden change in financial circumstances. Visit https://www.newpaltz.edu/give/crisisfund/ to learn more about these funds, and how your support could make a huge difference for a student in need. Among the noteworthy guests in the audience for Davis’s Distinguished Speaker Address were a number of students and teachers from Poughkeepsie High School. Also in the audience was Stephanie Blaisdell, vice president for student affairs, and a former colleague of Davis’s during her time in the Division of Student Affairs at the University of Memphis. “I am fortunate to count myself as one of the many individuals who have experienced Rosie’s generous and effective mentoring,” Blaisdell said. 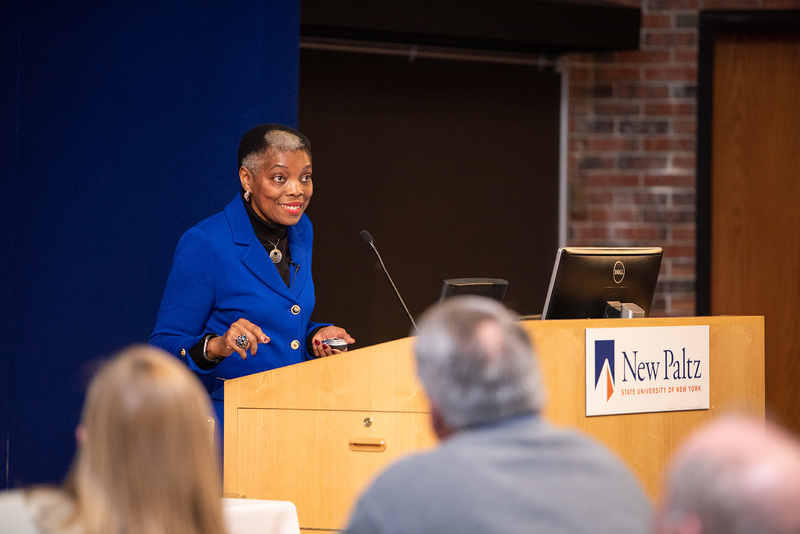 The spring 2019 Distinguished Speaker Series event was made possible by the SUNY New Paltz Foundation, Inc., with support from the following sponsors: Buttermilk Falls Inn and Spa, Henry’s at the Farm, Campus Auxiliary Services, M&T Bank, Sodexo, Rondout Savings Bank, Hampton Inn, Novellas New Paltz, Riverside Bank, the New Paltz Regional Chamber of Commerce, Lola’s Café and Catering, and Royal King Cleaners.